There are a huge range of trees for our pleasure, for animals and for food. Many times they let us know about the times and seasons (if they are deciduous trees) with their leaves (or lack of leaves!) showing us what the season is. In our photo below, we can see trees during the autumn months. 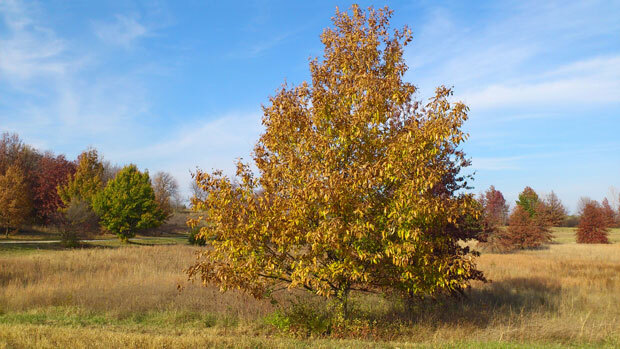 The picture below was taken near Longview Lake, south of Kansas City. The trees were right at their autumn best, with reds, yellows, greens, oranges and every shade in between. As well as seeing these trees we saw amazing vegetation and even an eagle! God has a great plan for our life (Jeremiah 29.11-12), but this plan comes in steps (Proverbs 20.24) that God guides if we let him. Like every tree, God has also made each of us completely unique and different and he will work with each of us in unique ways. Like the trees, he made us all different sizes and colours and with different purposes. But all trees in a sense bear 'fruit' (when we say fruit, we mean leaves etc, it's just a metaphor!) In the same way, God has called each of us uniquely, but each of us have been called to 'bear fruit' for God. Fruit here means 'good works which God prepared in advance for us to do' (Ephesians 2.10). God has a great plan for your life! Revelation 22:2 - down the middle of the great street of the city. On each side of the river stood the tree of life, bearing twelve crops of fruit, yielding its fruit every month. And the leaves of the tree are for the healing of the nations. God made the trees, just as he made all of us. He uniquely shaped us in our mother's womb and formed us for a purpose (see Psalm 139.13-16). Let's recognise each season of our life, follow God's steps and not our own and stay close to God - who is like our tree of life! A Prayer: Lord, thank you that your Word says that you came to give me life in abundance. Thank you for the lessons we can learn from your creation - like the trees. Thank you for making me unique, for knitting me together and caring for me so deeply. Thank you for your plan for my life and that you are the tree of life. I choose to follow you and choose life. Amen. I was once in a situation at a church where some things had gone wrong. As a result I was asked to stand in and cover a couple of things temporarily until they could be sorted out. I was happy to help where I could. Someone spoke to me and said they had a picture for me - where I was standing strong as flood waters surrounded and as the water levels rose. But I stood strong. The reality was that was what was happening - God was helping me stand strong as the 'waters' rose (and then went back down)! Psalm 1.1-3 - Blessed is the one who does not walk in step with the wicked or stand in the way that sinners take or sit in the company of mockers, but whose delight is in the law of the Lord, and who meditates on his law day and night. That person is like a tree planted by streams of water, which yields its fruit in season and whose leaf does not wither – whatever they do prospers. This photo was taken in the Lake District early one winter morning. 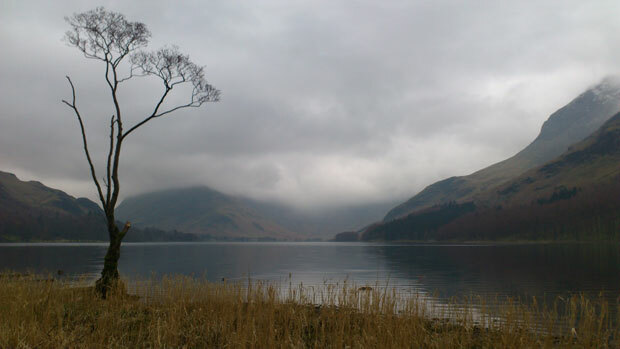 The tree seems to be standing watch over Lake Buttermere (with Crummock Water not far behind it). To me this picture is really significant and is an image of Psalm 1 where the Psalmist starts by saying how God's blessing (God's favour) is on a man or woman of God who delights in God and who obeys God's Word. That person is like a tree planted by streams of water, yeilding its fruit in season, prospering in all they do and whose 'leaves' don't wither. A prayer - Lord, I trust in you. My confidence is in you. I pray that you would deliver me from evil. My delight is in you and I choose to read, think about and obey your Word, the Bible. Lord I want my roots to go down deep into you and I know that as I read your Word this will happen by the power of your Holy Spirit. Thank you Lord that I do not have to fear when heat comes, nor when there is drought. I will never fail to produce good God-fruit in season, my faith won't wither and I am blessed by you. Thank you. Amen.